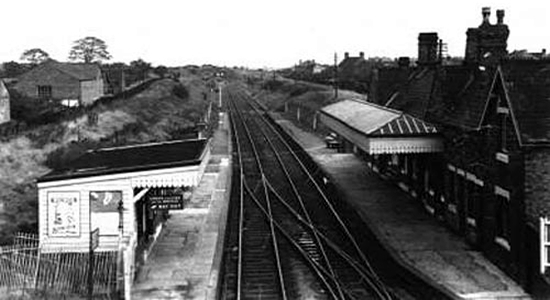 One of two Brownhills stations in the area, this station opened under the South Staffordshire Railway in 1849 and some years later came under LNWR ownership. 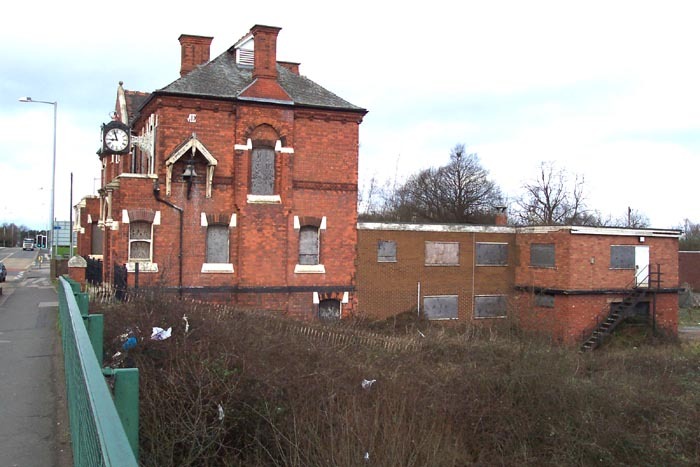 Whilst its Midland Railway namesake a short distance away enjoyed a relatively short shelf-life, this station remained open to passengers until the 1965 vast culling of the region's railways in which the whole of the line from Lichfield to Walsall was closed to passengers and retained merely as a through route until 1983. Above we see the station in the 1950s (photo: Clive Roberts) looking down from the Chester Road North/High Street bridge in the direction of Lichfield: note the spiked metal railings on the Lichfield platform in the bottom-left corner of the photograph. 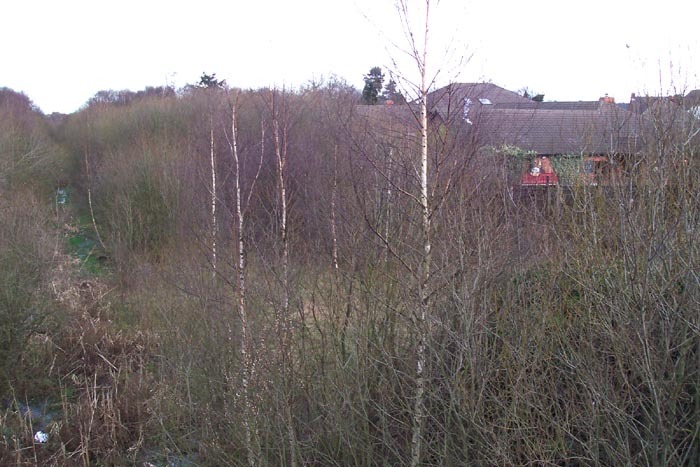 Today, the site has undergone something of a major cleansing with the railway buildings being swept away and a more arboreal appearance developing from the trackbed itself as we will see below. If above was the before, above-left is the 'after': this is exactly the same shot today - totally unrecognizable. To compound matters further, the trackbed itself appeared to be carrying a lot of surface water - in and around the piles of dumped refuse - which, added to the heavy foliage developed over the years, rendered a track level exploration futile (I have considered returning in better weather but I guess then the foliage will be thicker so I feel this is as good as it gets regarding my perspective on Brownhills). Above-right we are in the same spot but looking more to the left than previously - the open space seen on the left is the yard of the Housing Department: now also disused! Eager to find something even vaguely interesting and reminiscent of the railway I panned right but to no avail. It was only when I turned to the extreme left - pointing in the direction of Chester Road North - did I capture a sign tying the site in with the 1950s photograph: if you open the large version of the photograph above-right, you will see a line of spiked railings leading down from the photographers level to the trackbed, the bottom of which can be seen on the Walsall platform in the Clive Roberts photograph. I was initially excited at spotting the building in the above-right shot from the distance when driving to the site but after a good look around decided it was nothing of railway interest: a pub maybe (the Bell Inn - it has a large bell on it?)? 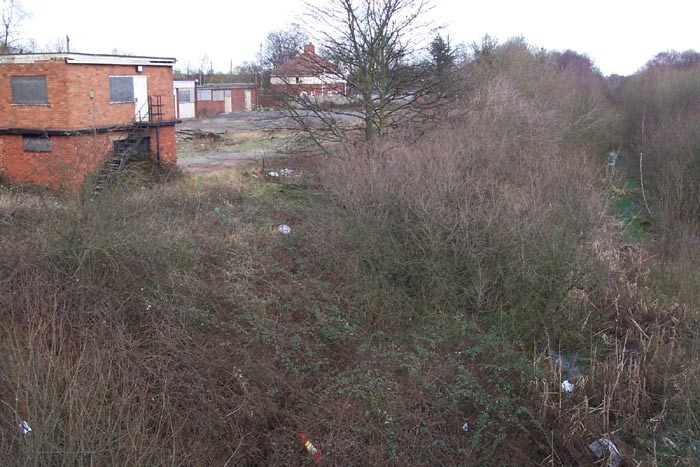 Above-left we have turned 180 degrees and crossed to the centre of what is now the A452 traffic island and are looking along the trackbed to Walsall. 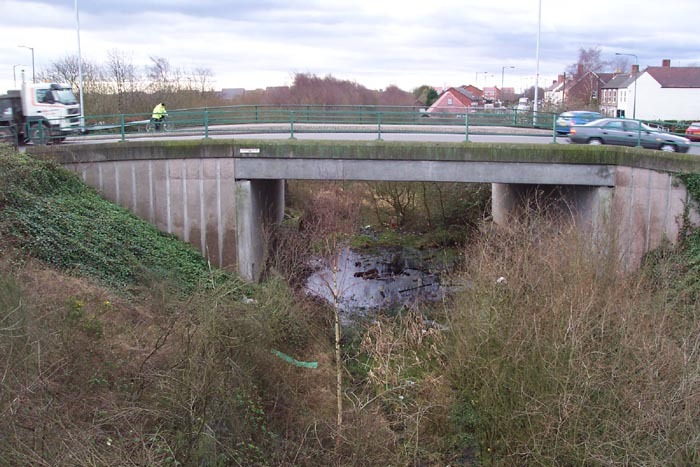 I wasn't 100% certain as to the original position of the bridge from which the 1950s photograph was taken upon my arrival at the site as considerable road realigning and building has taken place here during the intervening years. 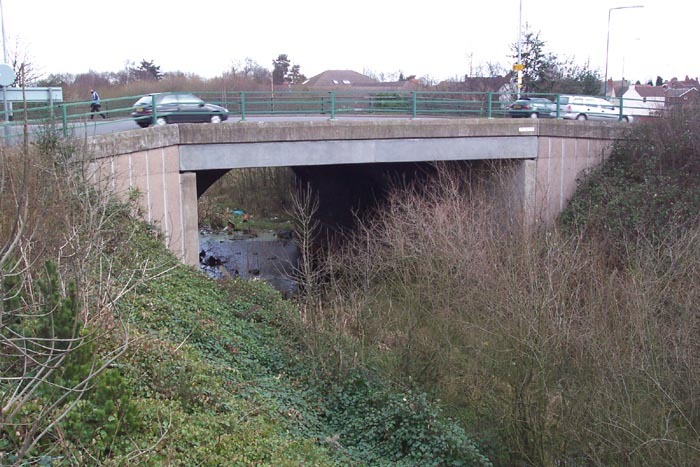 However, after crossing to the other side of the island and looking back towards the station site my fears of missing the correct spot were allayed as you can just make out in the photograph, the original blue-brick archway of the original road bridge under the 1996 constructed concrete traffic island. 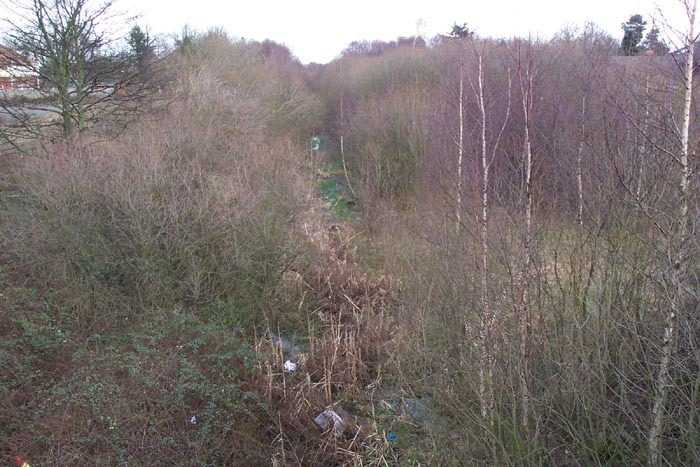 Above-left we are still on the A452 traffic island but looking at the trackbed heading off towards Walsall. 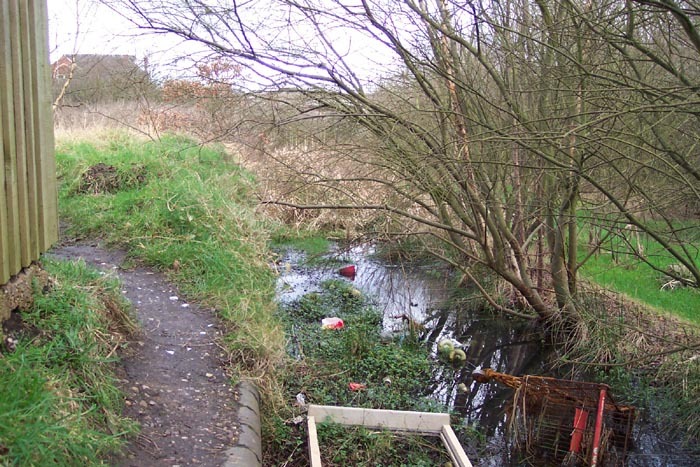 It was from this vantage point that I noticed something else of interest at trackbed level but faced serious problems in getting close enough to investigate further due to water. 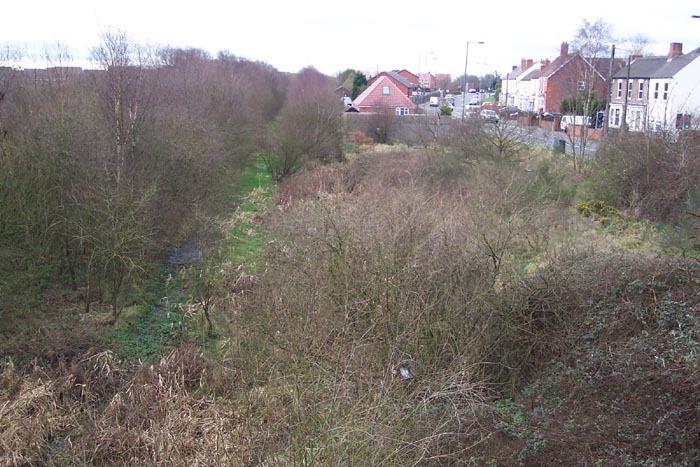 However, above-right I have scrambled down to trackside and you can just make out a line of blue-brick walling largely covered with earth and vegetation but which forms a low walling along the side of the trackbed. I am not sure what was at this part of the site originally, but certainly there was some sort of structure here - even if it was only a retaining wall! All-in-all, not a particularly impressive site to visit nowadays but a few interesting clues as to its original existence still prevail.